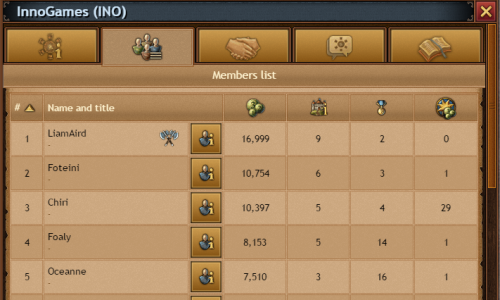 It is highly recommended that you find a tribe to join as soon as possible if you are a new player. While it is possible to create your own tribe, we would recommend waiting with that until you have more experience to do so. To join a tribe you can wait until you receive an invitation or directly apply to a tribe in your area. 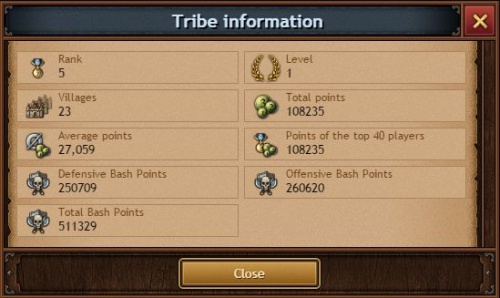 To view a list of tribes, you can open the tribe window from your Tribe menu. Most tribes will typically show whether they are allowing applications or not. They will also list the name of the leader or recruitment manager. This is the person you should mail to inquire about an invitation. Some tribes also make their tribe "open", meaning you can join without an application. 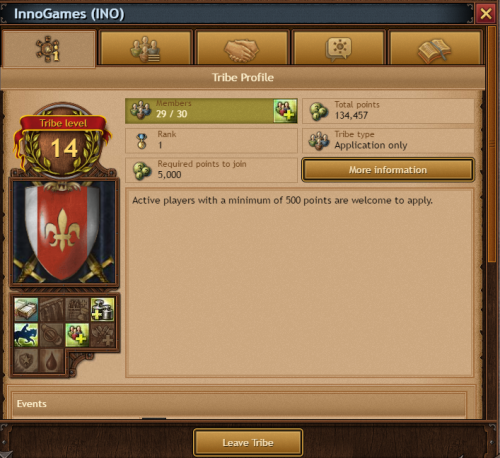 Most tribes are asking for an application text to recruit members that fit their play style. These applications are visible only to tribe members with the appropriate rights. So, don't be frustrated if some tribes do not accept your application. Just try another tribe. Especially in the early game there is a high fluctuation of tribes and tribe members. The field “tribe type” tells you how to join the tribe. Either anyone can join the tribe by simply clicking on the “join” button, located on the bottom of the page. Be aware of the point requirement! If your points are below than those required, you cannot join. “Application only” indicates that you have to write an application and then the tribe leaders can decide to accept (or reject) it. Finally, “closed” means that this tribe does not take new members at the moment. It gives the same information as for external players but it also give access to the diplomacy, tribe forum and the tribe skills from the tabs on top. It gives an overview of the events concerning the tribe and its members and it allows you to leave the tribe if you want. In the events section you can also see which tribe members conquered or lost a village, and you can directly open the village info screen of the respective village. Depending on your rights within the tribe you can change the tribe settings at the bottom of the page, too. This is how the tribe rankings looks like. From here you can sort the list by any column you want (eg by villages or honor points even by activity). From this tab you will also be able to see if any of your tribe members are being attacked. There are a number of privileges that can be given to each tribe member. You can choose a predefined role (like leader, diplomat or forum moderator) for a member, or adjust the rights manually. The rights will be explained in the table below, starting from the left side icon. Allows the player to administrate the Tribe diplomacy. Allows the player to use the member management of your Tribe. You should be careful when assigning this right. A malicious player could kick all the members of the tribe. Allows the player to change the Tribe profile. Allows the player to do the recruitment of your Tribe. Allows the player to change the Tribe settings. You can pass your Founder rights at any moment to whoever you want. Please keep in mind that this action is final and you cannot undo it. Never give full rights to members unless you trust them. They can disband your tribe, and once that is done there is no way to get it back. You will need to recreate it from scratch. In this window, you can see your tribe's forum. 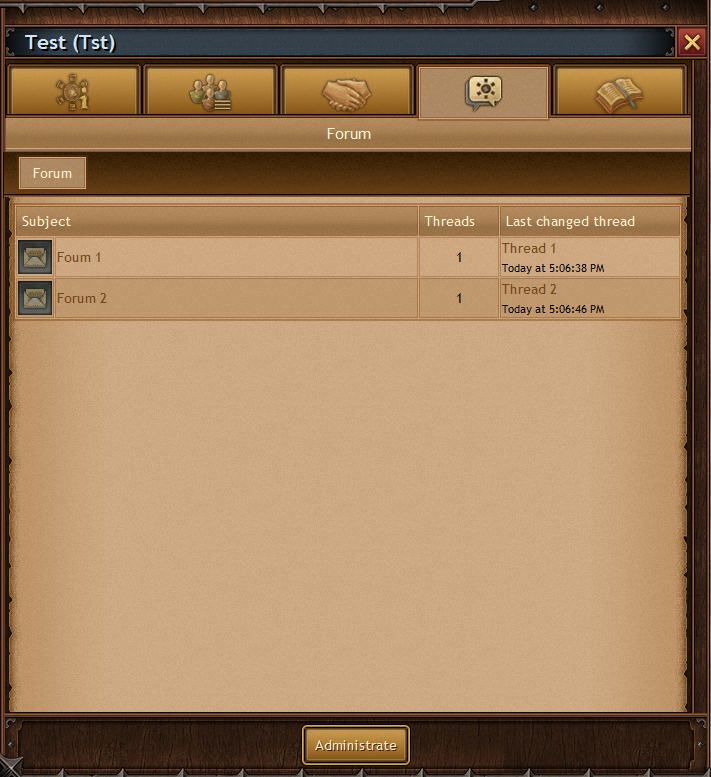 On the forum, you can easily discuss your tribe's life, attacks, defenses, and it is a very good way to get to know each other. Tribe members with enough rights can edit the forum, and they can add, or remove threads from it. Only forum moderators, and leaders can administrate the forum, which means that they can add, or remove sections from the upper bar. You can select and copy text from a forum thread and paste it to another section of the forum or in a message to another player. If you aren't happy in your tribe, it is always possible to leave. 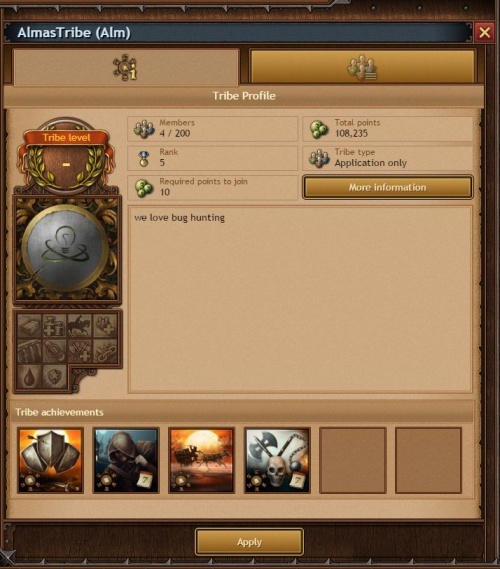 Click "Leave tribe" to drop out of your tribe in the Tribe>Profile tab. As a tribe founder, you cannot leave your tribe before passing on your "founder" rights. Or you can disband your tribe when you are the only one left in it. This page was last modified on 29 October 2017, at 17:41.